I am a big fan of Paul Hollywood. Not only is he a fabulous baker with some amazing recipes, he is great at explaining techiniques and method. On camera, he virtually always mixes with his hands, not using so much as a spoon, let alone an electeic mixer. His kneading is impressively and skillfully done - sometimes one handed! Paul must have been one of the first bakers I saw on TV where the camera actually paid close attention to his mixing and kneading the dough. Watching his video clips unquestionably helped my technique and inspired me. This particular bread, which you can see Paul making here, is very tasty. It is moist and has a lot of sweetness from the fairly large amount of honey in it. The bread actually tastes a bit buttery, though there is no butter in it. I think it is particularly good as toast or dipped in winter soups. I skimped a bit on the saffron and wish that I hadn't; my loaf had a few bright spots of yellow, but the overall hue of the interior was muted. This dough is very easy to work with and has a very springy, pleasant texture. 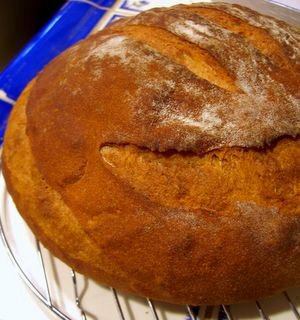 The recipe online differs slightly from the one in Paul's book, mostly in the ratio of whole wheat (wholemeal) flour to plain flour. I used a combination of bread flour and whole wheat, but used more bread flour overall. Make sure to use a very sharp blade to make the slash around the circumference of this loaf, as a clean spiral will look amazing once the bread is baked. In a large bowl, combine 1 cup whole wheat flour, 3/4 cup bread flour, all the yeast and 1 1/4 cups water. Stir well and let stand, covered, for 4 hours. Warm remaining 1/4 cup water and dissolve saffron in it. Add to flour mixture, along with remaining whole wheat flour, salt and honey. Gradually add the remaining bread flour, mixing until the dough comes away from the sides of the bowl. Turn bread out onto a lightly floured surface and knead until elastic and smooth, 4-5 minutes. Place bread in a clean bowl to rise, covered, for an additional 30 minutes. Shape dough into a ball and place on a lined baking sheet. Dust with flour, cover with a clean dish towel and let rise for 1 hour. Meanwhile, preheat your oven to 425F. Slash loaf with a sharp blade and bake for 25-30 minutes, until the loaf is a dark gold and the bottom sounds hollow when tapped.